A clash on Monday 20 Aug on Dhaka University campus, when students at a football game were manhandled by soldiers, has escalated into a nationwide student revolt. 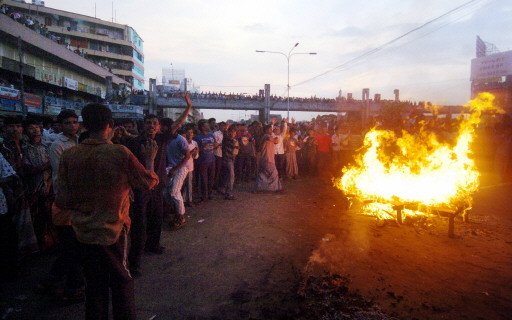 Despite apologies for the assault from the government, their withdrawal of troops from Dhaka campus and the promise of an official enquiry, unrest has spread and become a more general protest against the caretaker government and its long-running State of Emergency. The six cities affected were the capital Dhaka, northern Rajshahi and Sylhet, and southern Chittagong, Barisal and Khulna. These cities are now under indefinite curfew enforced by army and police. All universities and colleges have closed and mobile phone communications are blocked. Students across the country have rioted and demonstrated, and have been joined by "large numbers of ordinary people" - they have "fought running battles with police, damaged huge numbers of private and public vehicles, and attacked police boxes, banks, public and private offices, and shops as furious demonstrations escalated for a third day on Wednesday." (New Age, 22/8/07) During clashes demonstrators used bricks, sticks, barricades, fire and petrol and blocked roads and rail tracks - while the cops used teargas shells, batons, water cannon and rubber bullets that resulted in injuries of several hundred people. "Chief Adviser Dr Fakhruddin Ahmed Wednesday night said the government hoped the people irrespective of class and profession would extend all cooperation to the administration in maintaining peace and discipline in society and the trend of democratic and economic progress....."
Those who entered the city unaware of the curfew have been beaten by law enforcers as have those who were stranded at transport centres and others who ventured out for basic supplies. Soldiers have also beaten up journalists, despite them being officially exempt from the curfew. The participation of the wider population is interesting, but we should consider the possible different motives of those involved. In Bangladesh students are far more from the higher classes and elites of society and so more connected to the political arena, partly because in such a corruption-riddled society political connections are almost essential for any later career advancement. Most political factions are strongly represented at universities; so some students (disproportionately more than the rest of society) are members of the two main political parties, the BNP and Awami League, who have been prohibited from political activity since the State of Emergency imposed by the military-backed caretaker government in January. The leadership and finances of both parties has been severely damaged by the anti-corruption purges and mass arrests (well over 100,000) of recent months, so both parties have an interest in destabilising the situation as a means of pressuring the present government. In the period leading up to the State of Emergency violent street demonstrations were used as a polical lever by the opposition Awami League to destabilise and disrupt the country; this has long been a traditional tactic in Bangladeshi politics. Previous military governments have been toppled by movements begun by student agitations. But there has been growing unrest amongst the wider population too. The present caretaker governement - which it seems clear now was pressured to take control by the western powers (EU, UN, IMF, US etc) worried about the political turmoil last year being a destabilising influence on the South Asia region - has followed IMF policy and imposed privatisations on the Chittagong docks and in the jute mill industry. Pressure is also building to open up extraction of energy resources (e.g. open cast mining) to western companies. The country has also been hit by massive flooding in recent weeks, with millions made homeless, and water-borne diseases are rife. So we would not be surprised to see that the poor of the country are joining in the student unrest on their own terms, using it as a means of looting much-needed goods and attacking the same police and army who enforce a brutal 'order' in their workplaces and neighbourhoods. Since the major garment workers revolt last year some factory bosses have still not delivered promised improvements in working conditions and pay. Strikes have gradually increased again since the caretaker government's takeover in January. Large numbers of jute mill workers are being laid off (as part of privatisation of the jute mills) and are still trying to secure several months of unpaid wages. Rampant inflation of basic necessities, caused mainly by suppliers deliberately hoarding to create artificial scarcities, eats deeper into the wages of some of the most poorly paid workers in the world. Yesterday, Thursday, the curfew was lifted for 3 hours and today it has been suspended between 8am and 10pm. On the present situation in Bangladesh- "state of emergency" declared.